This is the best way to turn vegetables into tiny kid-friendly nuggets. Making homemade veggie nuggets isn’t hard and beat the store-bought versions! 1) Chop carrots, parsnip, new potatoes, golden beet, and broccoli into one-inch chunks. Bring a pot of salted water to a simmer and blanch all the veggies until tender. I recommend blanching the broccoli separately from the others. The sturdier veggies will take about 10 minutes to soften, while the broccoli will take 2-3 minutes. 2) Drain the veggies and add them to a food process along with the Serrano pepper, olive oil, salt and pepper. Pulse the mixture until it’s mostly smooth. 3) Transfer the pulsed veggie mixture to a baking sheet and spread it out into about a 1/2 inch thick layer. Transfer baking sheet to freezer and let freeze for 15-20 minutes until the mixture is hard, but not completely frozen. 4) Use a cookie cutter to cut shapes out of the cooled veggie mixture. 5) In two small bowls, whisk together the eggs in one and measure out the bread crumbs in a second one. After you cut out the shapes, dip them in the eggs and then in the breadcrumb mixture. At this point you can either add the breaded nuggets to a baking sheet and freeze them and then transfer them to a freezer safe bag. They will keep great for months. 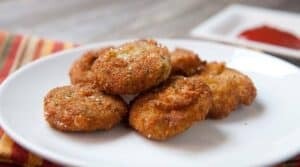 Or you can fry the nuggets immediately by heating oil to 350 degrees F. Once the oil is hot, fry the nuggets until they are golden brown, about 3-4 minutes. Then transfer the nuggets to a paper towel to drain. Serve the nuggets while warm with ketchup and a sprinkle of salt. This delicious recipe was brought to you by Macheesmo. Read the full post at https://wp.me/pkSYO-bMq.